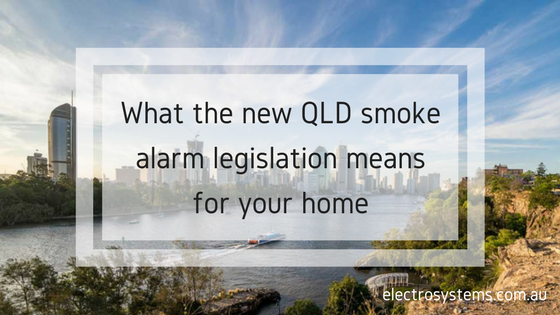 Earlier this year Queensland's updated smoke alarm legislation came into effect mandating that homes throughout the state be fitted with interconnected photoelectric alarms to ensure the earliest possible warning for all residents in the event of a fire. The current system often relies on a single battery operated smoke alarm to provide advance warning of a fire for a whole house. This has been shown to be tragically inadequate in some fire situations. The new requirements will mean that regardless of where the fire starts everyone in the home will be alerted and have a chance to escape. The updated legislation also calls for the alarms to be either hardwired to your home's mains power supply with a battery backup or if this is not possible an interconnected system which is powered by tamper-proof 10-year lithium batteries. Both options are a much more reliable power source than the old style 9-volt alarm. The new legislation has a roll-out timeframe of 10 years. Depending on your property situation you are required to update your smoke alarm system within this period. From 1 Jan 2017 when replacing alarms they must be the photoelectric type. if no bedrooms on a storey the alarm must be located in the most likely path of exit. From 1 Jan 2017 property sellers must continue to notify the Queensland Land Registry Office stating smoke alarm requirements have been met. All smoke alarm replacements, upgrades, and installations must be carried out by a licenced electrician. For more information on the new requirements for the smoke alarms in your home speak to our Brisbane electrical team on 3881 0956 or complete our enquiry form today.